"Entry into Moscow is forbidden, and here I am, confined in Boldino. In the name of heaven, dear Natalia Nikolaevna, write me, even though you may not feel like it. Tell me, where are you? Have you left Moscow? Is there a roundabout route which might lead me to your feet? I am completely discouraged, and I really do not know what to do. It is clear that our marriage will not take place this year (accursed year)...Boldino has the air of a rock-bound island. No neighbors, no books. Frightful weather. I spend my time scribbling and fuming... Write me some news of him, because I am not reading any periodicals at all here. I am becoming imbecilic with a vengeance... But enough of bad jokes. I'm smiling yellow, as the fishwives say... Farewell, my beautiful angel. I kiss the tips of your wings, as Voltaire used to say to people who were no peers of yours." In gardens, in the dead of night. Their tears, and their belated ruing. .. Forty-eight hours before the wedding Pushkine went to the gypsies. "Sing me something to bring me luck," he said to Tanya; "I'm getting married, you know." Tanya took her guitar and intoned a song so mournful that Pushkin suddenly burst into sobs and buried his head in his hands. His friends rushed over. "Ah!" he said, "that song has finished me. It foretells some great sorrow, not joy." On the eve of the wedding, Pushkin invited his friends to bury his bachelorhood with him. A dozen guests gathered around the table, all prepared to joke, laugh and drink, as is the custom on such occasions. But their host was so lugubrious that they hardly dared open their mouths. He recited some lines of farewell to his youth - as though he were taking leave of life itself, not just unmarried life; as though he were about to die, not acquire a wife. He was reading his last will and testament, uttering his final word: Tomorrow he would cease to exist. His listeners stared at one another in dismay and shook their heads. Then, with foggy brain and contracted throat, Pushkin left them to make his final visit to his fiancee. The next day, February 18, 1831, the marriage of Alexander Sergeyevich Pushkin and Natalya Nikalayevna Goncharova was solemnized in the big Church of the Ascension at Nikitskaya Gate in Moscow. Police directed the arrival and departure of the coaches. Inside the church, a large, elegant, malicious, whispering throng crowded into the nave. 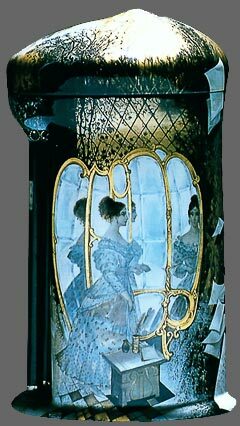 Natalya's entrance into the gilded cavern filled with wavering lights and incense was greeted by a rustle of admiration. The choir sang lustily. The bride came forward gliding over the carpet, so light, so white, so beautiful that Pushkin was genuinely moved. He smiled broadly and drew himself up to his full height, for Natalya was taller than he. The ushers held the ceremonial crowns over their heads. The bearded, solemn priest intoned the words uniting them for life. The guests chattered in undertones, estimating the cost of the gowns and the probable consequences of this extravagant display. Suddenly, during the exchange of rings, one of the circlets fell to the floor. Bending over to retrieve it, Pushkin knocked against the lectern and, according to one witness, the crucifix and Gospels dropped with a thud. Pushkin's candle went out. The poet stood up again, extremely pale, and simply murmured, "All the bad omens..."
On February 8, 1837 Alexander Pushkin was mortally wounded in a duel with Baron George Heckeren d'Anthes, adopted son of the Dutch minister then resident in St. Petersburg, and died two days later. D'Anthes had been the centre of scandalous gossip regarding Pushkin's wife. Perhaps partly to quell this talk, he had married Natalia's sister, Catherina Goncharova. But the talk did not die, nor, according to some biographers, did d'Anthes' attention to Natalia, even after his marriage. After Pushkin death and a year of the grief in the country Natalya Goncharova returned to St. Petersburg, and the Tsar, meeting her in the English Store, declared that he would like to see her back at the Court balls. 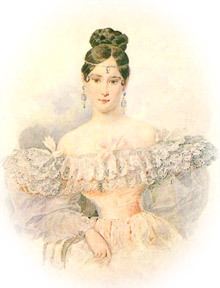 She had two sons and two daughters by Pushkin, for whom the Tsar provided generously. In 1844, she was re-married to an old admirer, Major-General Peter Petrovich Lanskoy. On his marriage he was quite suddenly promoted by the Tsar to Commandant of the House Guards. The Tsar insisted too on having a portrait of Natalie placed in a photo album of all the officers, and on becoming godfather to her first child. She appears to have been more happily married this time, had two children and died on November 26th 1863 aged fifty-one.